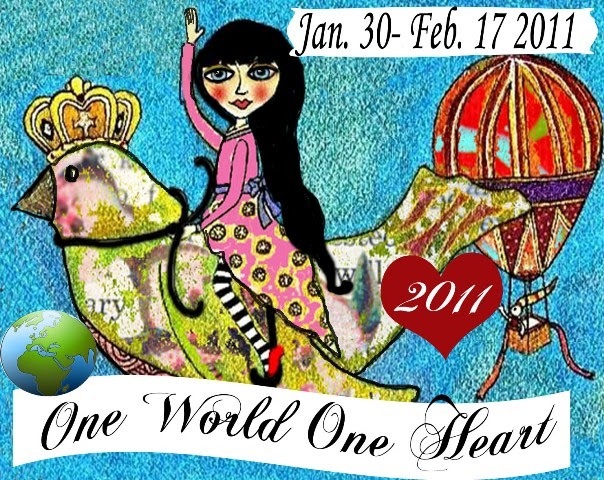 One World One Heart is coming again 2011. IT WILL BEGIN ON SUNDAY JANUARY 3OTH WITH THE FINAL DAY BEING FEBRUARY 17TH. (the day winners are announced) 2011. Click the picture to go to the instructions. This will be the last year. Lisa works very hard on this. I met so many awesome people last year!! It is such a nice blog happening, but there are rules and it is good to read them ahead of time. You don’t have to post and you can just visit the blogs (People gave away awesome things last year) but the more the merrier and let’s all send Lisa and One World One Heart off with the biggest event ever. It is not about the goodies that the bloggers give away though, it is about all the bloggers of virtue you will meet. So many with so much to offer. Nobody says it better than Lisa though, click on the picture above for the rules. 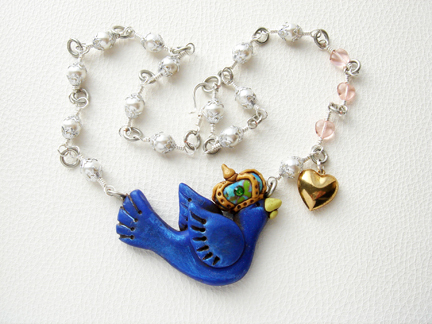 Check out Lisa’s talent at the A Whimsical Bohemian. Thank you so much Lisa for all of your hard work and love. If you ever want to feel great about your self, mark this post and read it again sometime when you are behind. 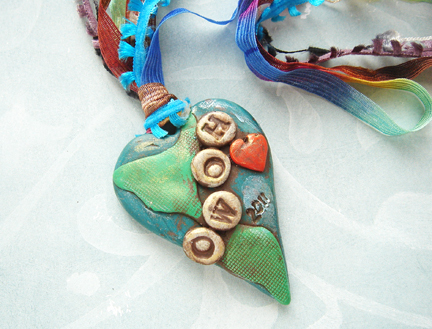 At the end of January 2010, I committed to something called OWOH (One World One Heart), it is a blog social where everyone visits each others blogs and comments. Each blog host has a giveaway of some sort. I had such a great response and enjoyed my self so much. I had 2 people shy of 300 responses or comments. For every 50 people, I offered up a handmade goddess or angel made for them according to a few questions I would ask them. That is 5 pieces. This is also my first post for the OWOH explaining the rules and what I was going through at the time. I went to every blog on the list too. I had the time of my life for being in one of the saddest to date places I have ever been, needless to say doing the blog social is the best thing I could have done at that time, it kept me busy! I just finished my 3rd one, 4 months later, I have two more to do. I haven’t gotten the instructions for one yet! That is a long time to finish these pieces. I did though, warn everyone that they would have to wait for me, the reason being that these pieces, even though I have information, pretty much speak to me about what is supposed to be on the goddess or angel. It takes time. I have to be in the right frame of mind. There is also study involved. 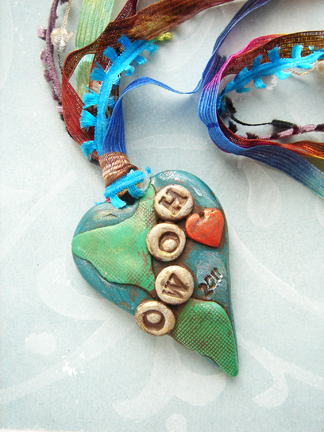 Visiting pages and looking for info, every detail will make a difference in the finished pieces. Not only that, I have no idea what some of the things people request are. The 3rd one is gone, it was shipped off and Elizabeth from Altered Book Lover http://alteredbooklover.blogspot.com/ has received hers. I took a very long time with this one, there were not many things for me to choose from on her list. 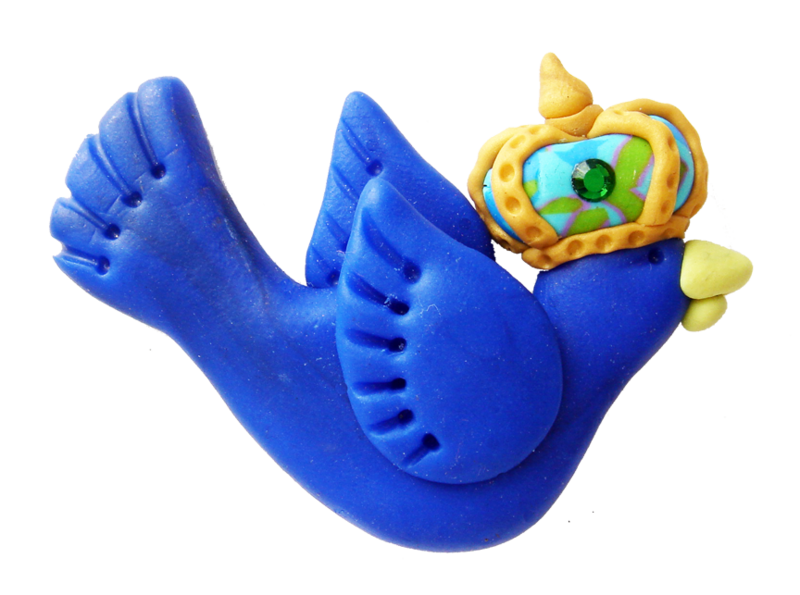 She loves her cat Bleubeard and her friend plays the steel drum, all the clay and wire should match, do not clutter it up, Crown and wings. I thought “oh merde” this is not enough info. I can not do this. Not enough info. And what the hell is a steel drum anyway?? 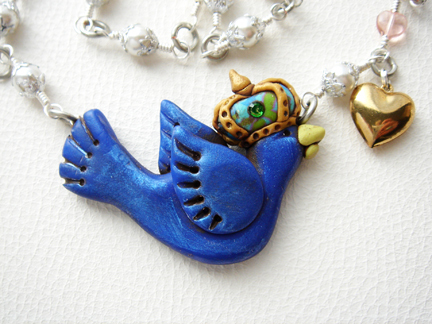 Well, here it is, uncluttered for my work, matching wires and clay, steel drum, Bleubeard, wings crown. I added a halo of peridot and hoped that it wasn’t over the top and a bit too much per Elizabeth’s instructions. The reason I added the peridot is myth, but lovely myth. Peridot jewelry is used to help dreams become a reality. Peridot is given as a symbol of fame, dignity, and protection. Legend has it that pirates favored peridot to protect them against evil. When the peridot was set in gold it also protected the wearer from terrors in the night. Peridot has been mined from St John’s Island in the Red Sea for over 3500 years. Peridot is the US State Gemstone of Nevada. 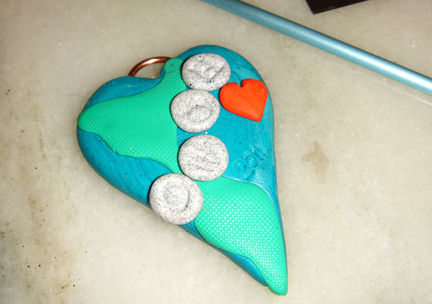 The stone is so sweetly light green in chip form that I thought it would not distract. Giving someone protection in thought and heart is a good thing in my opinion and I have grown to like Elizabeth a lot. I like her attitude and her blog. Not only have I gained insight about clutter, steel drums, and helped my sad state, I feel I have also gained friends from this experience. The more I blog, the more I love it. 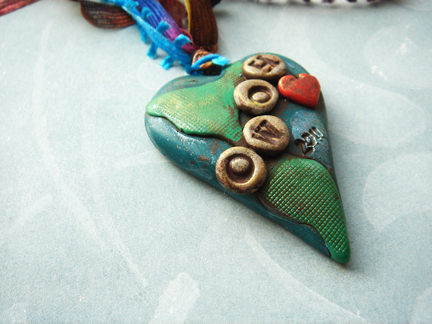 Li from the blog My Thoughts my Voice http://mythoughtsmyvoice.wordpress.com/ is my third winner from Lisa Swifka’s One World One Heart Event http://awhimsicalbohemian.typepad.com/a_whimsical_bohemian/one-world-one-heart.html. She is another angel out in blogland that loves to do all kinds of crafts, but her love of crochet has come back to her and she is exploring it again and enjoying it very much! She loves to read a good book when she has time. She picked the colors yellow, blue, and pink because they are happy colors. I never would have used these colors in one of my angels with out someone requesting them and I am so glad that Li did. I am very happy with the results on this angel, she is happy! Li also asked if I would put something on there that represented me. I loved that, I thought it was unusual, but I was flattered that she wanted me on there. So for you Li I have added the California sun for happy days and a sunny heart where ever you may go. 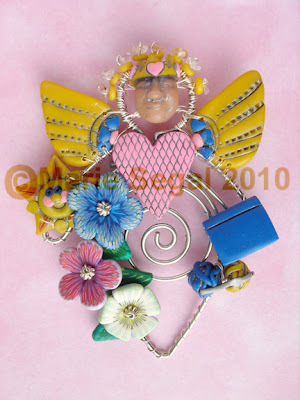 I have also added the flowers I make in the color that compliment your angel because I love making them and right now they do represent me and the place my work is at right now! 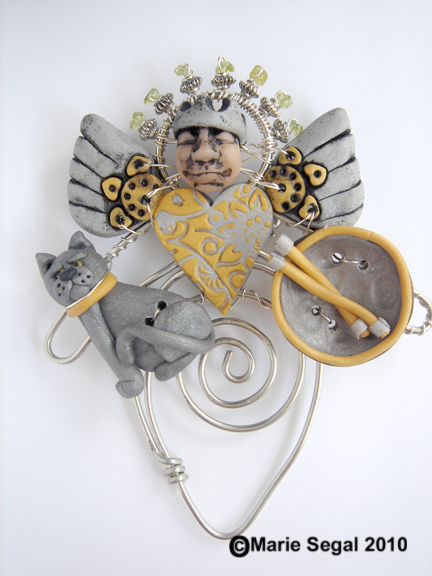 Li your angel is done with a silver colored 16 gauge wire formed into and angel body and wrapped with a silver color 24 gauge wire. Her face is done in a flesh tone Cernit clay, and is adorned with a yellow Cernit crown with pink hearts all the way around. She also has a halo of wired on citrine and quartz chunks. Citrine for clarity and creativity and quartz for protection and positive energy. 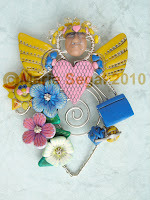 The wings are made from pink, blue, and yellow Cernit and the wings, face, sun and heart are washed with Pewter Lumiere. I made you a good book so you will always have one on hand and two balls of yarn and a crochet hook to take where ever you go. 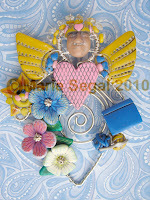 Li I hope you like your angel, she is filled with love for you and positive thoughts. Thank you so much for giving me a chance to do something I wouldn’t have done.